ROYAUME UNI – – York - Engineers repairing a York sewer found more than they bargained for when they uncovered a Roman mosaic floor. A 120-metre section of damaged Victorian sewer in Toft Green was in the process of being replaced when workers spotted the mosaic tiles. 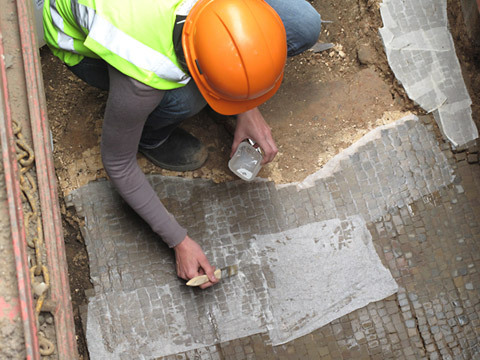 Work immediately stopped and a team of archaeologists stepped in to carry out a detailed study of the site, confirming that engineers had stumbled upon a Roman mosaic floor, dating back to the 3rd to 4th Centuries AD. After two weeks of excavations the floor has been painstakingly removed. Part of a mosaic showing a bull with a fish tail was discovered in this area of Toft Green during construction work in the 19th century. 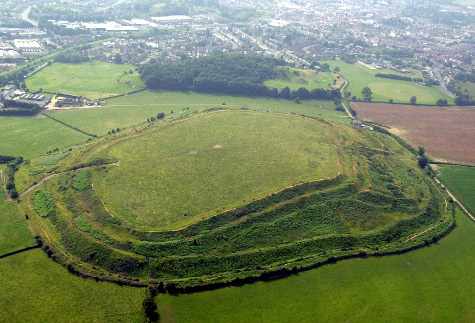 ROYAUME UNI – Oswestry - A group launched to protect an Iron Age hill-fort in Shropshire is being revived to ensure it is protected for generations to come. Campaigners are relaunching the Old Oswestry Landscape and Archaeology Project to look after the monument, which is in the guardianship of English Heritage. It is seen as one of the most important hill-forts in Europe and campaigners say the project group will be key to making sure its landscape and plantlife are preserved. FRANCE – Caen - Depuis la mi-juillet, le sol du château de Caen est fouillé. Si certains participants des émissions de télé réalité ont parfois du mal à garder leur secret, le château Ducal, en plein coeur de la capitale régionale, avait réussi, jusqu’à il y a peu, à en conserver un de taille : la présence dans l’angle nord-ouest de l’enceinte, au pied du terrassement d’artillerie, d’un édifice monumental. "C’est en 2005, à l’occasion d’une opération d’archéologie préventive sur le site des salles du Rempart, que nous avons trouvé les premières traces", explique Bénédicte Guillot, archéologue. Ces vestiges inattendus pourraient profondément changer la vision des Caennais sur l’agencement intérieur du site. Large de 13 mètres, long de 24 mètres, le bâtiment, sur deux niveaux, est contemporain de la salle de l’Échiquier, "qui date du XIIe siècle". 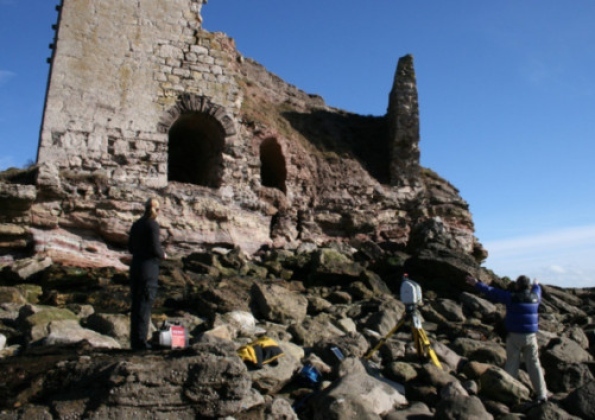 ROYAUME UNI – Ecosse - Citizen Archaeologist Boddin Limekiln, Angus Walkers are being recruited to keep a protective eye on almost 1,000 sites of archaelogical interest scattered around Scotlands coastline that may otherwise disappear beyond trace. The citizen archaeologist project is being launched by a charity, Scottish Coastal Archaeology and the Problem of Erosion (SCAPE), and the University of St Andrews, which want coastal visitors to track sites on an interactive map, take pictures of any erosion they see and answer questions about what it looks like, via a free smartphone app. CROATIE – Dubrovnik - Over the last ten days, researchers from American archaeological research organisation RPM Nautical Foundation, in collaboration with colleagues from the Croatian Centre for Underwater Archaeology in Zadar, have been researching the seabed near Dubrovnik on Croatia's southern Adriatic coast, reports RTL. The 3.5 million US dollar worth vessel "Hercules" was placed at the position of a possible shipwreck. "We can hold a position so that the ROV (underwater research robot) can dive down and check the target comfortably and without haste, and without the danger that the ship will be moved by the sea currents," said Edwin Vella, the captain of Hercules. ROV is equipped with two control arms, cameras, and a sonar to locate targets, such as shipwrecks or other valuable sites. Traveling from Prevlaka to Cavtat, Hercules sonar revealed a dozen possible wreck sites. 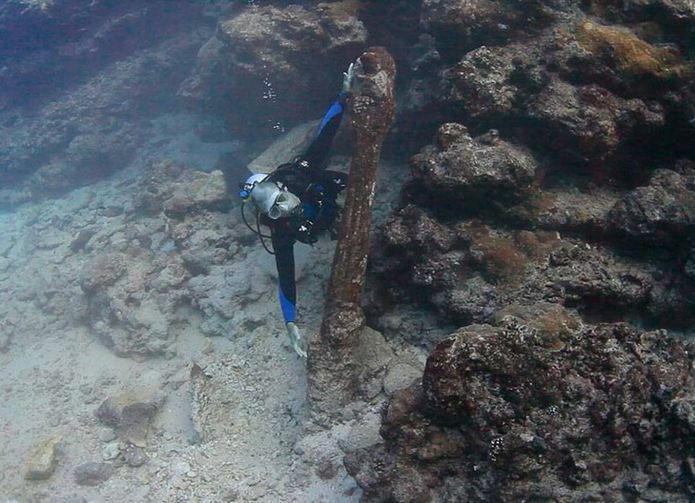 "The first wooden ship could date back to the 17th century, while we suspect that the second one dates back to the Napoleonic wars, because there was a great battle here in 1806," said Luka Bekic from the International Centre for Underwater Archaeology in Zadar. The last day of research was also very successfull, ROV's cameras showed the two sunken amphibious ships. TONGA – The wreck of a 19th-century pirate ship believed to contain a hoard of treasure may finally have been found off Tonga, according to officials on the South Pacific island. The Port-au-Prince, a British privateer which had seized treasure from French and Spanish vessels, sailed into Tongan waters in 1806 in search of whales. However, it was seized by the local chief, Finau Ulukalala II, whose warriors massacred most of the crew, including the captain, William Thompson, and then scuttled it, so Tongan legend goes. Although the chief salvaged cannons and iron – then of great value in Tonga – from the ship, the rest of the treasure was supposedly left intact. Britain's National Maritime Museum has dated the wreck at between 1780 and 1850, on the basis of copper cladding on its hull. Ms Fifita said that local divers were still mapping the wreck for further study.